We’re in the thick of Modern season, a place that breeds creativity and rewards those who dare to explore the boundaries of an infant format. With only a few of these seasons under its belt and a wide open card pool, I thought it was pertinent to explore some possibilities. Those of you who have been PPTQ’ing like me, attended Grand Prix Charlotte, or simply like new things should be pretty happy with what we’ve seen in the last few weeks. Very different top 8s, new decks breathing life into the format, and old standbys remaining contenders but not being overpowered. But if you’re really like me, you want to be winning with Red. And today, more specifically, SKRED. I’ve been revisiting this deck since the results of the SCG Invitational clearly begged for the return of Blood Moon. Amulet Bloom Combo and RG Tron were everywhere on Day 2, and while the results leveled out at Grand Prix Charlotte, many decks in the format can still be punished by elements of Skred Red. Blood Moon lets you do many things due to the time it establishes while your opponent tries to find answers. Davis’s build skews more towards a Control angle. 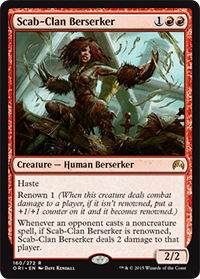 There are powerful finishers, along with the Boros Reckoner / Skred Combo, and this is backed up by sweepers. I like that approach, but generally I tend to play more aggressive decks and I noticed there are games that you sometimes need more threat power. Either you have a Blood Moon out and no threats for a long time, or you don’t have a Blood Moon and you’re hoping your sweepers buy you enough time. These situations only come up in a fraction of games, as the deck is largely consistent, but the hamster wheel got turning when Davis was telling me about losing twice to Scapeshift in a PTQ where he went 6-2. I thought, why limit ourselves to Control when we can pretty much do whatever we want, and just have Blood Moon run interference. The ability to kill any creature, and two cards that are reasonable just by themselves. 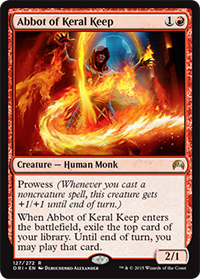 There are a lot of useful X/1s in Modern, and Sparkmage puts the kibosh on those. 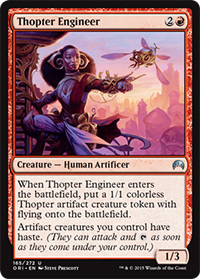 Noble Hierarch, Elves (seeing increased popularity), Affinity’s creatures, Viscera Seer, Infect’s creatures, etc. 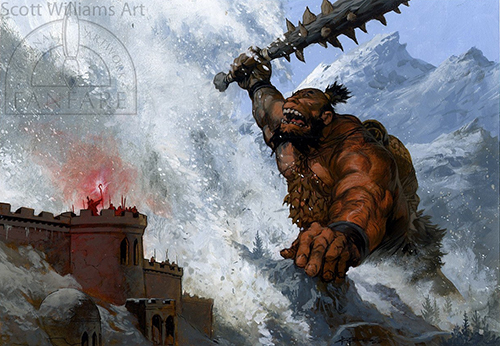 I had tested Burn against a local friend and newly donned pro Fanchen Yang who has been playing Elves for quite some time, and Anger of the Gods / Volcanic Fallout was something that could be recovered from in many games. 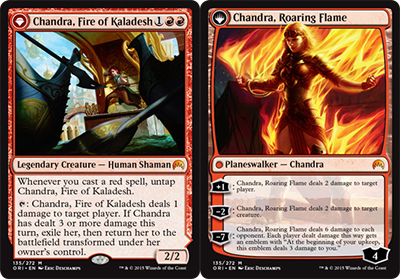 Those cards still might be the best way to attack Aggro decks, but they’re not great against the Midrange part of the field and not nearly as fun as the combo above. I talked about the new brew on Facebook and in my other podcast (Card Knock Life) this week and received some interesting ideas. 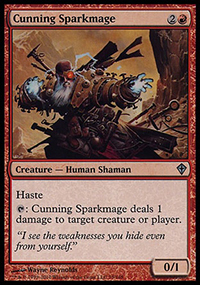 First was to replace or supplement Cunning Sparkmage with Vulshok Sorcerer, who was just a straight upgrade in the deck. I had been looking through the gatherer quite a bit, but sometimes you just forget/miss some possibilities and it was early in the brewing stage. There’s so many choices available for a deck like this, that I’ll warn readers this is simply a rough draft. I jammed a good number of games on Cockatrice and really liked what was going on though, so it’s something I’m still continuing to test. 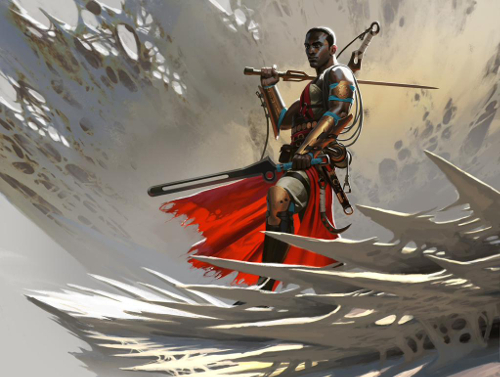 Cards that were on my flex list from the get-go and running forward were Spikeshot Elder, Stigma Lasher, Spellskite, and Sword of War and Peace. None of these are necessary for the deck’s theme, they’re just good cards that I wanted to get a feel for. 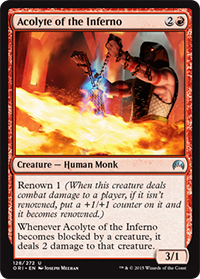 Mogg Fanatic, Grim Lavamancer, and a variety of other cards that work with Basilisk Collar or Skred were on my radar. I’ve subbed some of these in since the original list to see how the deck does with different orientations. 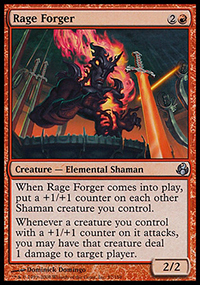 On the Card Knock Life Podcast, Corey suggested Fanatic of Mogis for a Devotion route since the deck already features a lot of Red mana symbols, along with Ash Zealot as some extra game against Snapcaster Mage and to give the deck added aggression. I was a bit hesitant on the podcast in my response, but I did toss a few games in with it to see what it felt like. It actually seems really strong, and opens another avenue you could take the deck towards. 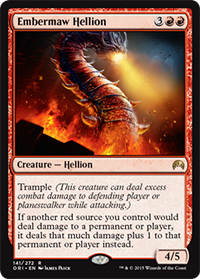 Red Devotion was a very powerful deck in all its iterations for Standard, and when you combine this with Blood Moon along with the potential for faster deployment, you could end up with something great. Consistency is the issue, as it takes a card away from your hand, it doesn’t permanently accelerate you, and there’s only a limited number of them in your deck. It’s also not fantastic by itself, although it is nice that you can still get a 2/2 sometimes if that’s what the situation calls for. I don’t know if a Devotion build has room for something like this, probably just as a 1-2 of if any at all, but the other builds of Skred really love to get their tech online fast. 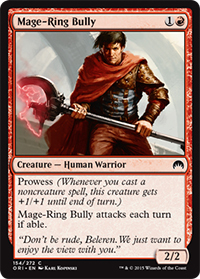 And any deck with Eidolon or Blood Moon gets a serious leg up with his inclusion. 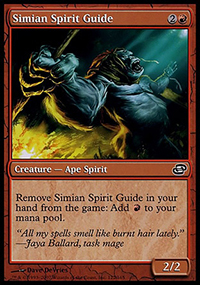 Burning-Tree Emissary is the more natural Devotion enabler, but one of the drawbacks he always had was that he couldn’t accelerate into the RR creatures and spells. In Modern, the RR creatures are your basic bread and butter, so it’d be hard to cut some of them although there are a laundry list of 1R creatures to look through as other possible options. 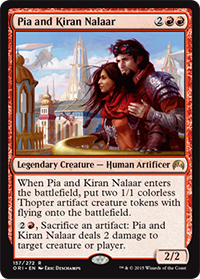 Playing him also puts you pretty full tilt into Devotion, and I’m again not sure that the full-on Fanatic of Mogis plan is warranted. Davis mentioned he has tried it in the past in Skred, and that he felt at the time there was too much removal in the format. Personally I think there could be some room at the moment. 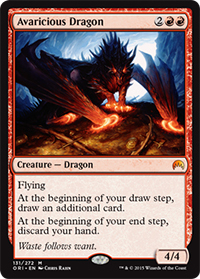 Aside from Jund, removal is fairly limited and pinpoint for most decks. 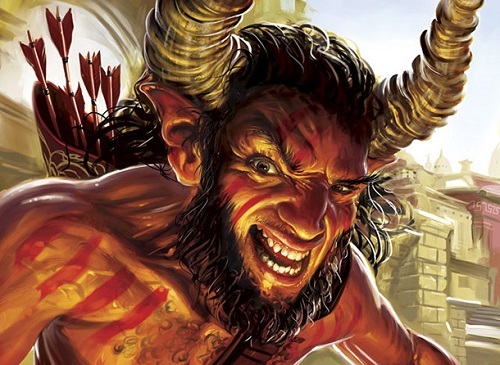 You’ll have your set of Lightning Bolt, your occasional Path to Exile or sweeper, but these are things that don’t generally nuke your whole deck and can be played cautiously into. The advantage we have is that the opponent has a known archetype, and we very much do not. You’re also going to play most of these cards anyway if you’re playing an Aggroish Skred, so a few Fanatics is just a solid curve topper that can accelerate your win by a turn or two. It also gives you some long game and is difficult to deal with. I’d like to share a decklist, but I also don’t like posting hot garbage when I can avoid it and the Devotion build is just not tailored enough yet for consumption. That said, I have hope, and will continue to post on Twitter and Facebook as developments come along so stay tuned for that. 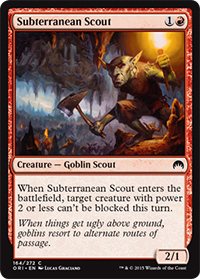 Another route you could go with Skred that carries the Aggro theme forward is Goblins. I was playing Burn at a PPTQ a few weekends ago and felt very confident in my list. I sat down against my round 1 opponent who had just graduated high school and he seemed like a fairly nice, casual guy. Hopes were high, but then the next thing I know he cast Browbeat and I’m forced to let him draw three cards. He follows it up the next turn by attacking me with a Goblin Guide, Goblin Grenade’ing it, and launches two Lightning Bolts at my face when I’m at 12 life and have lethal in hand. Ouch. Game 2 wasn’t any better, he curves Goblin Guide into Goblin Chieftain into Krenko, Mob Boss. 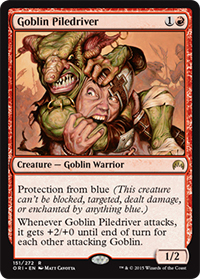 The Goblin lists in particular could fit the Skred shell because some of them already run Blood Moon to attack the meta and take advantage of their landbase. 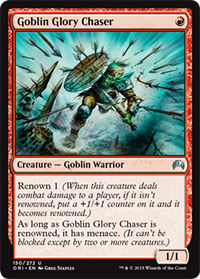 I spoke with some players online who have been playing Goblins, and they were completely in on the Blood Moon plan already, saying they had been doing very well at their LGS’s tournaments. 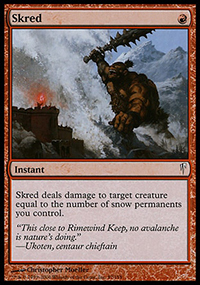 While Goblins requires few non-creature spells and would like to have some number of Cavern of Souls, it doesn’t seem completely unreasonable to have Skred and Snow-Covered Mountains here too. 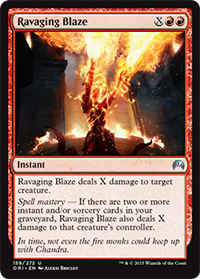 The only serious drawback is that one of the main reasons to run that combination is so you can use Boros Reckoner for loads of damage, but there still might be a way to squeeze these elements into a workable shell. It’s also possible that I’m stretching too much, but there are great minds out there and I think it’s worth a mention to see if someone can crack it before I do. In the time being I’ll be focusing more on Devotion and Aggro, but who knows what the future holds. . . I first saw this style of deck on MTGO a few weeks ago when I was birding decklists trying to find a Burn build with some new game theory. It was being piloted by Johnny Hotsauce (aka Andrew Shrout of SCG Fame). Tasigur and Self-Inflicted Wound were the big innovations, along with going back to a Black build in general to get that hyper-tempo play of Bump in the Night. Is Tasigur better than Grim Lavamancer? 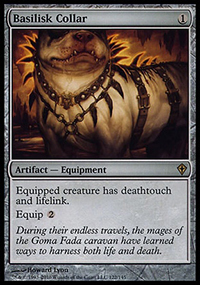 Is Bump in the Night + Wound better than Boros Charm + White Sideboard Cards? 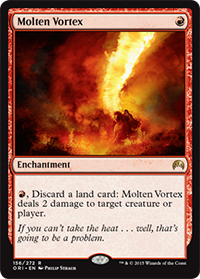 Tasigur adds an element to the Burn deck that is both unexpected as well as difficult/impossible for some decks to deal with. 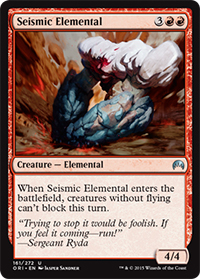 Decks like Twin and Grixis often only have a few removal or bounce spells to deal with him, and those are many times used up earlier on your other creatures or not found in time. He comes down just about as early as he does in the Blue decks, often on turn 3, and sometimes just later when you’ve exhausted other spells but haven’t finished them yet. He doesn’t die to the sweepers your other creatures do, and later in the game his activation ability DOES happen, bringing back Lightning Bolts for days. You’ll need to be mindful of what cards you delve and such, but it’s pretty easy to setup his ability for value, along with potentially reducing opposing Tarmogoyfs. Grim Lavamancer is powerful, and he does more of what Burn wants to be doing, so I can completely side with anyone who intends to remain Naya or straight RW. You’re just looking to kill your opponent, and he both provides that option through face bolts or by getting rid of creatures that make your job harder like Delver of Secrets and Heritage Druid. 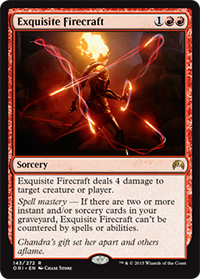 In the sideboard, cards like Path to Exile, Deflecting Palm, Stony Silence, Circle of Protection: Red, Kor Firewalker, and Lightning Helix all provide strong answers to decks in the Metagame, but most of them are equally questionable due to their lack of damage or built-in drawbacks. Path gives your opponent a land, which can sometimes be the kill shot, Palm can be played around once they know you have it, Stony Silence can come online too late, COP can be sandbagged until they release their entire hand in a turn sometimes or be destroyed, Kor Firewalker is hard to cast with the lands in the deck, and Lightning Helix is another two mana burn spell in a deck that’s overloaded with them. If anything, there’s one man who’s been getting it mostly right for the last full season. I mentioned Jasper’s deck in my last article so I won’t list it again, but I strongly recommend checking that one out if you haven’t already. He won a PPTQ with it, a friend of ours won a Las Vegas all-inclusive tournament, and they both top 8’d recently again at another PPTQ. His list doesn’t get cute, it’s all business and all specific. It eskews some of the more common choices, and I’m still not 100% sure it’s what yours truly wants to be doing, but it’s my usual go-to recommendation for most. The man has been “on fire” in Magic, making the Pro Tour in most of the last few seasons along with a tough loss for his win-and-in at Grand Prix Las Vegas. Fortunately two others from our Madison area made it into top 8, with one of them a well respected Aaron Lewis taking the whole thing down. This community is serious when it comes to the game, and the results will keep rolling as a result. I had seen him in the past, but never took the time to fully contemplate the text. This man puts Hellrider to shame. One mana less, permanent +1/+1 Counters, and damage on attack. Along with Flamekin and just by himself, he consistently enables early kills, usually on turn 4. He is the key piece of the deck, and a way to give you a default win in matches where you’re not working around certain cards. 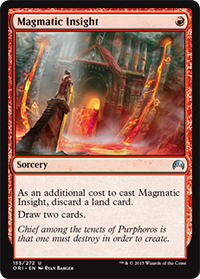 There’s a lot of incremental value in the deck too, with cards like Scavenging Ooze that work with Rage Forger, Manamorphose, Visionary, and Burning-Tree that help you cycle/accelerate through your deck. The sideboard almost feels like you’re playing a Gifts deck since you can tutor some of your bullets for immediate use. Bottom line, this is a sweet sweet brew, and I’d be very happy to PPTQ with it anyday. Next big tournament for me on the horizon is the StarCityGames Open in Chicago on July 18th/19th. Hopefully I’ll see some of you readers and listeners there while we break in Origins for one last hurrah with a Core Set.